My family is doing a staycation this year. We’re taking a few local trips here and there. But mostly – due to assorted work deadlines and exhaustion from our recent move – we’ll be at home in London. Apparently, we’re not alone. Here in the U.K., a combination of airline strikes and the Eurozone debt crisis have prompted many more British people to holiday at home this year. In the United States, the whole concept of staycation (a word now enshrined in the Merriam-Webster’s Collegiate Dictionary) has shifted from being a temporary outgrowth of the financial crisis to a social phenomenon that’s here to stay. I love London, so I don’t really mind being here in the summer. Still, the longer days, warmer weather, and changes to the kids’ schedules do inspire me to do things a bit differently, if for no other reason than to shake up my own routine. 2. Get a new toy. Usually, we associate the novelty of a new toy with children. But it’s equally valid for adults, who also need to play. This year, my summer treat to myself is a bicycle. Because our new house is located considerably further from the kids’ schools and assorted other activities, I find that I’m often in motion between the hours of three and five on any given afternoon. And so we finally broke down and bought a bike for me on Ebay. It’s one of those funky collapsible things – (a Brompton, for those in the know) – because I’ll need to take it on the Tube and the bus with the kids. Bonus? I feel terribly hip and urban. Bonus-by-association? Guess who’s got a handy new gadget to play with? 3. Learn a new skill. “It’s like riding a bike.” The only problem with that old chestnut is that it only means something if you actually *know* how to ride a bike. In light of our staycation, my husband and I took the command decision that this was an opportune time to teach my nine year-old how to ride a bike. (I know, I know. Ridiculously late to be teaching him this life skill, especially since his six year-old sis has been bike riding for more than a year. What can I say? We’re bad parents.) But we’re on it now, and – in light of #2 – it also means that we can now go for family bike rides. 5. Read some really long books. Let’s face it. We all have a list of books on our bedside table which – tempting as they might seem – we never get around to reading because they’re just too long. And I don’t mean the medicinal ones that you feel you *ought* to read so that you’re up to speed on such and such a topic. (Eternal Message of Muhammed anyone? Oh, is that just me?) No, I mean the really good ones that entail a level of commitment that’s just beyond your comfort level during a busy week. I just finished the third volume in the highly addictive Dragon Tattoo series – The Girl Who Kicked The Hornets Nest. Now I’m on to Hilary Mantel’s Booker Prize-winning Wolf Hall. Up next? Cloud Atlas by David Mitchell. If time, there’s always Tolstoy’s War and Peace. No, seriously. Don’t laugh. What are you doing this summer around home? For those who are interested, I’m over on Politics Daily today talking about a lawsuit against the British government on the grounds of gender discrimination in its new austerity budget. 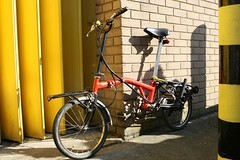 Image: Very early Brompton (number 333) by marcus_jb1973 via Flickr under a Creative Commons license. I like these ideas for a “staycation.” My kids have been away doing part work, part academic, part “play” things, but I’ve been all about #4 on your list above. And while it’s been unpleasant, it’s also satisfying to tackle something important, and make progress. Sometimes that’s easier when kids are on vacation, and for adults, it makes for a fully acceptable staycation. and where did you get the brilliant drury lane idea from? and i loved war and peace – it’s a total pageturner. wolf hall, on the other hand…. already tried it once and couldn’t stomach it. not looking forward to trying again. and i’m still trying to find a brompton on ebay. any guidance on best models and a fair price? I think I need to get a huge piece of butcher paper for my summer one and use the flip side for fall..
yes, @cecilia, it is key that everyone be doing the same thing or it doesn’t work! I would say put AK at the top of your reading list. Cheers!